Per Paul Kersey's SBPDL blog on unz.com, black violence in Jolly Old London is not working out per the narrative written by those who have ignored the words of the late Enoch Powell. The English statesman Mr. Powell was speaking about immigration of 3rd world foreigners from the former colonies about 50 years ago and mentioned something about rivers of blood. Mr. Kersey writes Blacks Are 13% of London, England's Population: Blacks Represent 50% of the Murder Suspects in London. That percentage and the violent crime ratio happens to be in the same ballpark as that in the US, for which apparently slavery and separate water fountains are responsible. Yet, in Britain, there was no institutionalized black slavery and they drink bottled water, don't they? Hmmmm, something doesn't computer. Well, see the English were "smart" and passed laws against gun ownership, so violcent criminals should not have guns, see? Also, knives along with possibly vans, next have been targeted for control. 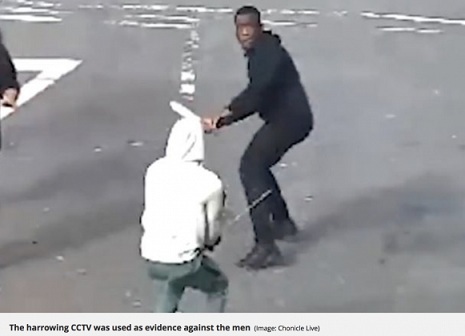 The two guys shown having it out in a knife fight in Newcastle City Center (oh, excuse me, Centre must not have kept abreast of the newer laws. You've just got to keep up with new Ministry of Truth memos, people! As a regular actual Englishman going about one's business in Newcastle City Centre or any other place full of non-law-abreast 3rd-world New-Castle-Comers, one may just have to run like hell away from the scene if the long blades are pulled out. That kind of thing can not only seem highly irregular, it can make one highly irregular. Just as with gun control, it is the same with knife control - when knives are outlawed, only outlaws will have knives. It's kind of hard to pull an Indiana Jones move, as seen below, when you're not allowed to defend yourself. Then again, Indiana Jones was a movie-American, and the kind of guy we are still able to emulate here in the colonies, for now at least. [UPDATED 4/17:] Added link to previous post on knife control.